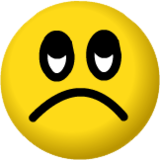 What do we do when we do not feel like singing during the worship service on Sundays? "I can clap. I can stand. when I don't feel like singing." The scenario pans out in many congregations across the nation. You are a worship leader. You have prepared really hard. You put in hours to deliberate the songs and to arrange them. You practice with the band on Wednesday. You sacrifice Saturday nights to rehearse and the whole session, Powerpoint slides, musicians, singers and all. Sunday arrives, and you lead with the call to worship. With vigor and enthusiasm, you summon the people to sing as one people, with the desire to worship in spirit and in truth. Instead, you are only accompanied by a handful in the congregation. Some yawn. Others mouth the words. The section on the left appears uninterested. The section at the far right keeps their heads done, preoccupied with devices glowing in the dark. People call these devices smartphones, but seeing how these things distract people from worship makes one wonder how smart the users are. A number of people strolls in late. One parent nudges her teenage daughter to stand, while two kids push each other in jest. Toward the end of the praises and songs, the sanctuary is finally filled, a far cry from the handful of eight persons at the beginning of the call to worship. Welcome to the Sunday worship service! A) Worship as a Prelude to Sermon? Some people like to come late for the singing, in time for the sermon, and super early for the refreshments. They give various excuses, all of which can be easily produced in brilliant and creative combinations. One blames the alarm clock which cannot fight back. Another shames the traffic in highways that are always packed. Some say they don't like the songs. Others claim the songs as too traditional or not conventional enough. One week, they say there are too many new songs. Another week, they say they find the hymns too boring and monotonous. When asked how is the service, many mention the pastor's sermon. Few talk about the worship mood and songs. If an alien is to observe the rising number of people entering the sanctuary, up to the moments leading to the sermon, it will pretty much see the worship as a prelude to the sermon. Worship is not just the singing or the playing of the musical instruments. It is the rousing of the hearts, the symphony of voices, and the unity of the Church that proclaims the glory and majesty of God. It is this Magnificent God that believers encounter each Sunday in worship, and to proceed forth to the world in mission. Worship in song is not a prelude to the worship in Word. Worship is very much the stilling of the hearts to declare the end of self-will, so that one can declare the praises of God, the One who has called believers out of darkness into His wonderful light. KEY: Worship is not the prelude to the sermon. Worship is the entire service, from beginning to end. Following the worship service, we are sent to the mission field in which our lives are to be reasonable acts of worship to God. B) Feelings as the Director of Worship? "I just don't feel like singing," pleads the Church member. This single reason is one of the most common. People sing only when they feel like singing. When they do not feel like it, they clam up and face down. Maybe, they will offer a token of light clapping, just to show some support. Another seems to be too distracted by the way the lady in front of him wears her hat. Still, another gets all sniffles when someone in front of him wears a sensitive perfume. For all the efforts the worship team has invested, seeing people disenchanted and in a perpetual mode of disinterest can be downright discouraging. Some people use "We are only human" as a way to excuse themselves from singing. Some in the congregation plead tiredness. Others say they don't know the song. Still others find songs as either too traditional or too contemporary for their own liking. Whether it is a bad week, exhaustion, or some human condition, many do not sing because they do not feel like singing. As worship leaders, it can be discouraging when this happens. We can try our best to lead people into worship, and yet some people simply keep their mouths shut or roll their eyes. So the question before us is this: What do we do when people don't feel like singing? Feelings are important, but in worship, some people may have misrepresented or even exaggerated their importance. For worship is less about how we feel, and more about WHO GOD IS. In worship, we submit ourselves fully under the lordship of Christ. We subject our feelings to the scrutiny of the Word. We give up our rights for self-will and embrace the responsibility of community life. We declare the end of our pride and wilfulness to usher in the beginning of humility and the celebration of four GWs: God's Will; God's Word; God's Work; God's Wisdom. Feelings are important, but they must be informed by faith. They must be led by faith. For worship is very much an act of faith. KEY: Feelings cannot be allowed to direct our worship. 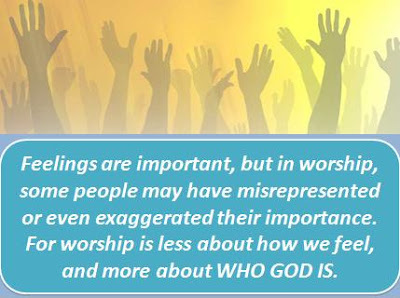 For worship is less about what we feel, but more about WHO GOD IS. Jesus says that true worship must be in Spirit and in Truth. Granted that sometimes our feelings may not correspond with the words flashed out in front of us. It is an honest problem. For example, how can I sing "I Surrender All" when my heart does not feel ready to do just that? This practical problem has a simple solution. Confession. Maybe, we can preface quietly each "impossible" word or phrase with the words: "Lord help me to ...."
(please help me to) _______ I Surrender All. In worshiping God in Spirit and in Truth, we are essentially letting the words and our hearts beat as one. We want to know Jesus more. We want to see Jesus lifted up. We want to worship in Spirit and in Truth. We sing what we feel. We feel what we sing. We sing praises. We feel His love. We submit our feelings under the lordship of Christ. There is no shame in bringing forth our truest selves before the Lord. He knows our every thought and our every emotion. When we sing, we sing not because of our lack, but we sing out of God's fullness. This is what worship is all about. It is not about how we feel. It is recognizing that God is Good, Glorious, and Gracious regardless of how we feel. In summary, worship is less about how we feel, but more of what God deserves. He deserves our worship. When we come to God in the Name of Jesus, we are subjecting our humanness under the lordship of Christ, trusting that even as we come as broken vessels, Christ can make us whole. What is impossible with man is possible with God. That is another reason why we sing. My brothers and sisters in Christ, worship well, not in our own strengths, but in God's strength; not on our own efforts, but as one united body; not according to how we feel, but according to Who God is. So when you do not feel like singing, say it out to God. Confess before the Lord. In due course, as we put God first, and as we subject our tendency toward self-will and joins with the rest of our brothers and sisters in Christ, we become one people, one body, one Church. In due course, God will give us a melody in our hearts that will chime a sweet sweet sound for God.